Ashmore Cottage in Holmgate, near Chesterfield sleeps 4 people. 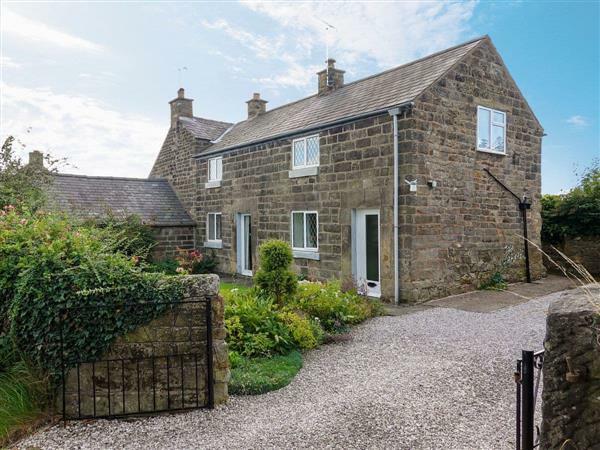 This attractive 18th century stone cottage is situated between Clay Cross and Ashover. It has a garage and an enclosed garden. It is within easy reach of the ’crooked spire’ town of Chesterfield, also Bakewell and Matlock. An ideal base for a holiday exploring the Peak District, Nottinghamshire (Robin Hood country) and south Yorkshire. Several stately homes and National Trust properties are less than 30 minutes drive away. Horse riding and choice of fishing venues are available locally. Shop 400 yards, pub ¼ mile. Ground floor: Living room. Dining room/kitchen. First floor: 2 bedrooms:1 double, 1 twin. Bathroom with toilet. Open fire in living room included. Night Storage Heating, electric and bed linen included. Cot. High-chair. Electric cooker. Microwave. Washing machine. Garden and chairs. Garage (1 car). Parking (1 car). One pet welcome under strict control please (livestock). Holidays at Ashmore Cottage run from Saturday to Saturday. For a better idea of where Ashmore Cottage is, you can see Ashmore Cottage on the map below. Ashmore Cottage is in Derbyshire; should you be on the lookout for a special offer, you can find all the special offers in Derbyshire. It's always worth checking to see what is on offer at the moment. Do you want to holiday near Ashmore Cottage (53), you can see other cottages within 25 miles of Ashmore Cottage; have a look to find your perfect holiday location.